The biomedical sciences major at Marquette University is an outstanding program of study that uniquely prepares students to study medicine and dentistry, as well as a variety of health-related professions. Students begin with foundational studies in the natural sciences (chemistry, biology, physics, mathematics) and humanities (including philosophy, sociology, literature, history and ethics) delivered through the university’s core curriculum. Then, beginning early sophomore year, students embark on a unique sequence of medically focused science courses, all taught from the perspective of human health and disease. This sequence begins with human anatomy, which includes an elective course in dissection of human cadavers (gross anatomy), and continues with courses in biochemistry, physiology, microbiology, pathology, pharmacology, medical genetics and more. This combination of extensive course work in the human medical sciences with education in the humanities and social sciences uniquely prepares students for the rigors of medical and dental school. In fact, there exist only a handful of similar undergraduate programs in biomedical sciences nationally, none of which include all of these facets. Graduates of the biomedical sciences program at Marquette are accepted to medical and dental schools at extremely high rates and, once there, thrive in the competitive environment of professional schools by virtue of their unique educational background. Why study biomedical sciences at Marquette? Medically focused curriculum. The opportunity to study distinctively human medical science courses at the undergraduate level is exceedingly rare. In fact, Marquette's biomedical sciences curriculum, taught by faculty scientists, is unique. Build a strong foundation in human anatomy. Learn the human body through an intensive two-course sequence in human anatomy and human gross anatomy sophomore year. This lays the groundwork for subsequent courses focused on human physiology, cellular biology and molecular biology that you will encounter in the biomedical sciences major. Develop your critical thinking capacity. The background provided by your curriculum will allow you to ask key questions and learn to arrive at answers by thinking critically in the context of scientific and clinical problem solving. Powerful combinations = competitive candidates. 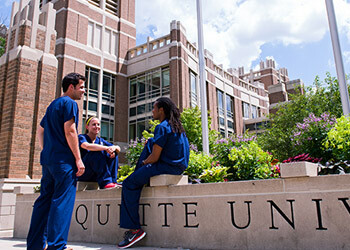 Marquette’s biomedical sciences major, together with the university’s core curriculum, produces graduates with a breadth and depth of knowledge uniquely suited for the study of medicine and dentistry. Outstanding advising. Our program includes a multitiered system of advising to ensure your greatest success at navigating the application process for medical or dental school. Topics covered include where to apply, letters of recommendation, the MCAT/DAT, interviewing techniques and much more. You will be fully informed. Learn science from scientists. Our faculty scientists are actively engaged in cutting-edge biomedical research and routinely welcome undergraduates to participate in research. We also offer a 10-week intensive research program in the summer. Pre-dent is not a major at Marquette. It is a statement of your intention to someday go to dental school. Students in our accelerated program receive their undergraduate degrees with conditional acceptance into Marquette's School of Dentistry, the only dental school in Wisconsin. Pre-dental scholars complete their undergraduate portion in three years, then take courses that count toward their bachelor's and dental degrees in the fourth year. Pre-dental scholars get both degrees in seven years.